Your Guide to Zombie (and related) Movie History, originally uploaded by Mister Wind-Up Bird. AKA “How Eric Spent His Halloween”. Not clear about the connection between Return of the Living Dead Part II and Dawn of the Dead? And still wondering where Day of the Dead 2: Contagium fits into all this? Then you’re probably the very narrow target audience for this diagram I put together! I have, to my shame and/or pride seen most of the movies listed here, plus a bunch of others I haven’t figured out how to put in yet, and I decided to use my zombie movie knowledge (with some help from wikipedia) to map out the most notable films, series and subgenres. Most of the influences are totally my own take on things, so let me know if you disagree. Let me know, too, what I’m missing and/or got wrong, and it’ll go into the inevitable “Your Guide to Zombie (and related) Movie History, v2.0”. Underwater Nazi Zombie Movie Showdown! The last few weeks have been a bit eventful, to be sure. Since my return from Australia, I’ve gotten engaged, finished writing and editing my PhD thesis, and started developing iPhone applications. But my real accomplishment is this: I’ve managed to catch up to what are, to my knowledge, the only two Underwater Nazi Zombie movies ever made. From the USA, weighing in at a lean 85 minutes, is 1977s Shock Waves. Directed by Ken “Meatballs Part II” Wiederhorn, this is the story of a shipwrecked yachting party, beached on a isolated island after colliding with a mysterious freighter. (So mysterious, in fact, that I don’t think its appearance is ever actually explained.) 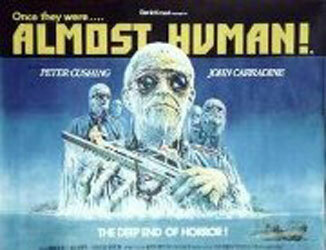 On the island they find an aging SS commander hiding out in an old hotel with a squad of Underwater Nazi Zombies. PG-13 chaos and carnage ensue. It’s a battle for the ages! A clash of titans! Who will win and who will lose!? Let’s break it down. Like any good grindhouse shows, these flicks have both been released under alternate titles as distributors change and hopes rise of tricking the unsuspecting into multiple trips to the drive-in or video store. Shock Waves has also been released under the titles Death Corps (which will also be the name of my grindcore band) and Almost Human (wait, what? that sound like a comedy about a wacky teenaged robot). 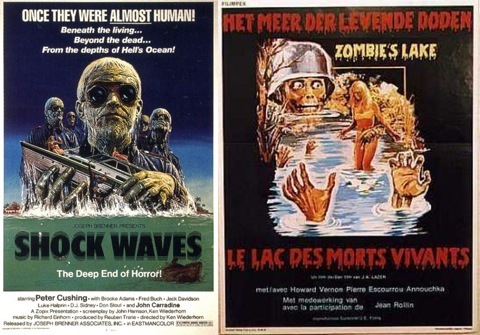 Zombie Lake has, besides the unimaginative Zombies Lake and Zombie‘s Lake, been released as pretty sweet The Lake of the Living Dead, as well, of course, as the original French title Le Lac des Morts Vivants, which sounds more Rohmer than Romero (ha!). Shock Waves has appearances by not only John Carradine (who I’m starting to think was just cast in every low-budget horror movie from 1965 to 1982), but also Peter Cushing, the same year he also played Grand Moff Tarkin in a little movie called Star Wars. Zombie Lake has Europe’s answer to John Carradine, Howard Vernon, as the mayor, and a cameo by the director as “Stiltz”. winner: Shock Waves. Though it would have been cooler if Cushing and Carradine were actually in a scene together. The zombies of Shock Waves are the remnants of the Toten Corps, a Nazi experiment to turn ordinary every-day thugs and murderers into unkillable zombie soldiers, and then apparently let them go to waste by making them pilot submarines. Stupids Nazis. No wonder they lost the war. The Zombie Lake lake zombies, on the other hand, are retreating German soldiers who were ambushed by the resistance. To avoid reprisals from other retreating troops (? ), the resistance dumps the bodies in a lake that was used for satanic masses (!). Now you know the recipe for zombie. 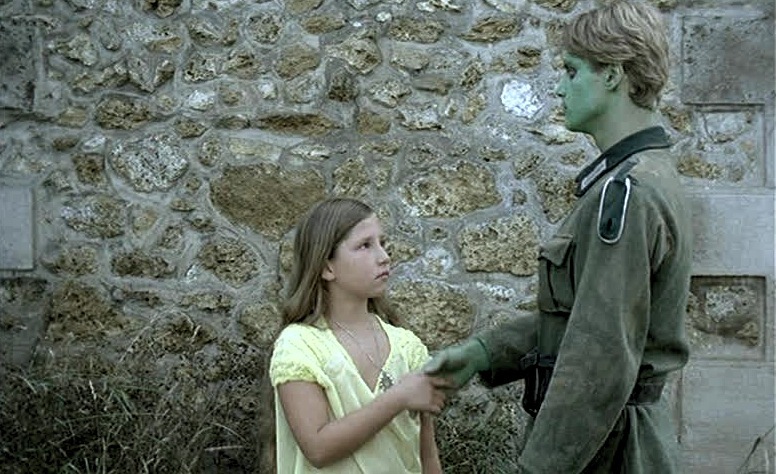 Oh, there’s also a subplot where one of the village girls was impregnated years ago by one of the now underwater and zombified nazis when he was merely a German soldier, and now papa zombie wants nothing more than to be reunited with his daughter (who is disturbingly undisturbed by the whole thing), but the less said of that the better. winner: Shock Waves by default. While I admire the balls it takes to pretty much say “a wizard did it,” it’s also a pathetic cop-out. The Shock Waves zombies are genuinely cool. 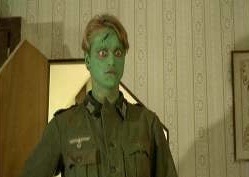 Nice make-up, cool rotting-SS-uniform costumes, and seeing them slowly rise out of the black ocean is genuinely creepy, even if it loses some impact around the tenth time it happens. The Zombie Lake zombies are just dudes in green Halloween facepaint. Sometimes they remember to make the neck and hands green, too. Sometimes they don’t. But they do remember to feather and blow dry their hair. In Shock Waves, the zombies kill the mostly-annoying crew and passengers of a Florida yacht. Yaaawwwn. Zombie Lake, on the other hand, is mostly memorable for the scene where the girl’s volleyball team pulls up next to a nazi-zombie-infested lake, half-heartedly bat around a volleyball in soft focus, and then start skinny-dipping only to promptly be eaten by underwater nazi zombies. Which never would have happened if an earlier buxom female skinny dipper hadn’t removed the “no swimming” sign before also becoming zombie chow. (Anyone who thinks Europeans are more sophisticated than Americans clearly has not seen enough Euro-trash horror flicks.) 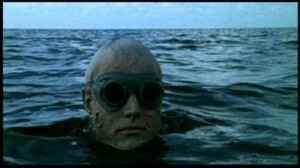 It’s actually kind of awesome, and immediately moved this from the worst underwater nazi zombie movie to the best. For about a minute. Oh, and paternal love plays a role. And flaming zombie-dummies being thrown out of windows. In Shock Waves, the tide begins to turn when the humans discover the zombies are vulnerable to having their sunglasses removed (double what??). But will it be enough to save them? winner: Zombie Lake. Just googling for that exchange of dialogue made me chuckle. Truth is, neither of these is very good. Shock Waves is definitely the better made film and has a couple of effective sequences, but that just brings it up to mediocre. Zombie Lake, on the other hand, has that wonderful combination of incompetence, contempt for the audience and general insanity that makes for a good badfilm. Not a great badfilm — it’s no Robot Monster or Manos: the Hands of Fate — but I’d probably watch it again before Shock Waves just for a few good laughs. Zombies of Davie Street, originally uploaded by Mister Wind-Up Bird. Despite a bit of makeup-melting rain, Vancouver Zombie Walk 2007 was a moaning, groaning, maggoty good time. Hundreds of zombies descended on the West End, trying to devour tourists’ brains, and swarming more than a few buses. The first zombie walk will always hold a special place in my heart for its novelty and sheer random enthusiasm, but the walk seems to be growing every year, and the sight of an army of zombies lurching down Robson Street was truly a beautiful, wonderful thing to behold. update (aug27): I’ve uploaded a bunch of pictures to Flickr. You can see my photoset, or everybody’s Zombie Walk 2007 pics! Also filed in photos by me, vancouver | | Comments Off on brrrrrrraaaaaaainnnnnnnzzzzzzzzz!!! I posted about this before, but Vancouver Zombie Walk 2007 is now fast approaching! This Saturday, the 25th, at the Vancouver Art Gallery. 3PM. I’m on this like maggots on an low-budget Italian zombie. It may well be the most awesome thing to hit Vancouver since Zombie Walk 2006. Damned. You are newly dead. Perhaps by my bite or by something more natural — maybe something airborne. The how is not so much as important as the why. What matters is that YOU have been chosen. You are one of ours. One of us. The awakening sleep. The living dead. Vancouver zombies, I call upon you to unite. And to walk. Birthed from the underground, our movement is slowly stumbling forward. Each year our numbers double and hundreds more Vancouverites fall in our wake. They are paying attention now, and they fear us. Aberrations — they call us freaks. Famished, we seek not fame, just brains. We are oh so hungry. Damned! We are unorganized. We are organic. And yet, this summer we stand as one. On August 25th we will limp forward, mobilized as a solid rambling mob. In our torn clothing and with blood spilling from our open wounds we will take Vancouver’s West End by surprise. From the Vancouver Art Gallery we will march. Spread the word, however you like. Bring your zombie friends. On Saturday, August 25th we feed. Zombie makeup how-to! Everything you need to know in one two-minute video. Oh my, yes. Mark your calendars, boys and girls: August 25, 2007, at the Vancouver Art Gallery. 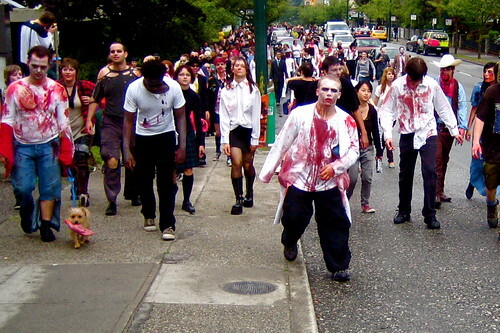 The original 2005 Zombie Walk was a blast: 200 zombies shuffling through Pacific Center mall and taking the Skytrain to Main Street. Last year, I skipped it to go the the Flugtag, which was kind of disappointing, especially when afterward, I could see zombies trickling home on the Skytrain. But this year, I’m back, and more putrefied than ever. update: If anybody knows what time the walk starts, email me or leave a message and I’ll post it.